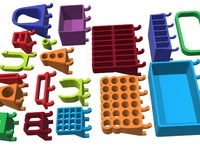 Thin components for Raaco storage by jensa is licensed under the Creative Commons - Attribution license. I love the Raaco storage boxes and use them for all my electronics gear. They're great to travel with and very flexible, but having a 3D printer one can always improve a bit. 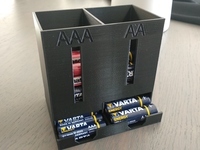 Resistors, diodes and other thin components don't really fit in any standard compartment, so here's my solution - a 2x1 box that has more compartments! Update: turns out 3 compartments only work well for those that have 10-20% tolerance resistor kits. I have some 5% as well, so I made some 4 compartment variations as well. I've also added a HTML file that has tables for the most common resistor values. I've used these to print out labels. 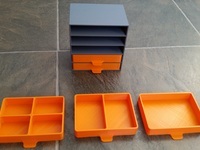 The boxes in the sample images are printed with @Colorfabb XT material. Transparent, strong and easy to work with. Say thanks by giving jensa a tip and help them continue to share amazing Things with the Thingiverse community. We're sure jensa would love a Tip, but unfortunately they have not setup their accounts to receive them yet.